The other day I was at work perusing Facebook during my, ahem, lunch break when a post written on Svengoolie’s wall caught my attention. The negative comment was regarding Sven showing non horror related shows like tonight’s DUCK SOUP as well as suggesting that he change the name of his program to “The Abbott & Costello Show.” Apparently the writer, who felt the need to publicly chide Sven as opposed to sending him a direct complaint (which he would have responded to), had a TV black-out the previous weeks when he aired HOUSE OF FRANKENSTEIN, PHANTOM OF THE OPERA, and THE DEADLY MANTIS. *Commercial TV horror hosts, a nearly extinct brand of professional entertainers, work for a television station. Their shows are based on ratings and not simply a desire to be a host. If you think this is an easy gig, just look at the great Elvira, who tripped over her own stilettos trying to make another go of her “Movie Macabre” 2010/2011. Now I really love The Mistress of the Dark and nothing made me happier than seeing her share the airwaves with Svengoolie. I only use her as an example of how tough this market truly is…even for her! * Working for a TV station means you have a BOSS. Sometimes the station tells you that you need to show a movie or two that aren’t horror themed. Most of our livelihoods are based on our employment. Fighting with your employer is a quick way to get you canned and (since its only once in a while) it’s a clear case for learning when to pick your battles…something professionals of any occupation knows how to do. *All of the ABBOTT & COSTELLO films shown by Svengoolie have had a horror or Sci-fi related theme. In 2007, after working his way up the previous 12 years through less desirable time slots (while airing less than stellar films) Sven received a prized package of Universal pictures. Despite their age, Universal is NOT cavalier about handing out these movies. They came not only with a substantial price, but with specific guidelines regarding when, and how often, they could be shown. This was never more evident than with the “ABBOTT & COSTELLO MEETS…” films. During that year, fans cried fowl when they were aired back-to-back and rerun not long thereafter. Svengoolie was cognizant of these gripes and convinced the “powers that be” to air some of his vintage shows FIVE nights a week on WCIU’s sister station, MeTV. It illustrated Svengoolie’s desire to please his fans while also allowing people, like myself (who missed the first 7 years of his return to TV in my own TV black-out), a chance to catch up on the great stuff we had missed. *DUCK SOUP is not the first time Sven has presented a comedy. CANNONBALL RUN, THE LONG LONG TRAILER, and LOOK WHO’S TALKING are a few other examples. What was interesting to me was not that Svengoolie presented a comedy, but how he managed to perfectly adapt his horror host schtick around it. Take THE LONG LONG TRAILER which stars Desi Arnaz and Lucille Ball and is often seen as a long, long “I Love Lucy.” Sven created a hilarious homage to that classic sitcom in between breaks ala “I Love Noosy” that was pitch perfect! 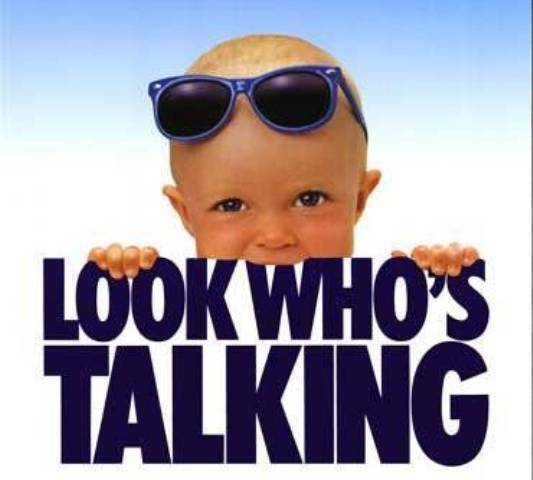 Here’s a secret…I absolutely can not stand the LOOK WHO’S TALKING films! Despite this fact, I couldn’t remember the last time I had laughed so hard watching his presentation of it, and not due to the comedic skills of Kirstie Alley and John Travolta. Clever Svengoolie touches which included a hilarious commercial sketch “Jenny Crib for Fat Babies” and a parody of an iconic Bee Gees hit which he revolved around diapers called “Stayin’ Dry” saw to that! I’m genuinely befuddled by the controversy behind a horror host airing movies outside of strict genre boundaries. Comedy was the hand maiden of horror from the very first spooky story every told around a camp fire, and horror hosts themselves have trafficked in lame puns and slapstick gags from the earliest days of television. The concept of the host itself is exceptionally pliable, particularly when the programs have a family-friendly flavor. Cleveland’s Big Chuck and Lil’ John transitioned from horror to general movie hosts years ago and still maintain their status as monster movie hosts. Columbus, Ohio’s Fred “Fritz the Nite Owl” Peerenboom is nationally recognized as a horror host, despite the fact horror represented only one fifth of the five nights of movies he presented on a weekly basis. Monday through Thursday were dedicated to westerns, classics and other general fare. But it was the Friday night horror show that defined him. 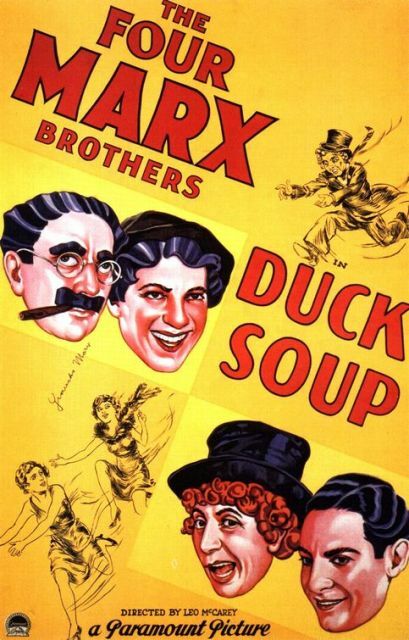 Having cleared all the brush, let me focus specifically on Svengoolie’s presentation of the Marx Brother’s greatest movie, Duck Soup. I couldn’t be more delighted. The hosting style of both Jerry G. Bishop and Rich Koz springs from the same vaudevillian turf as the Brothers Mark, Bud Abbott and Lou Costello, and Moe, Curly, Larry and sometimes, Shemp. 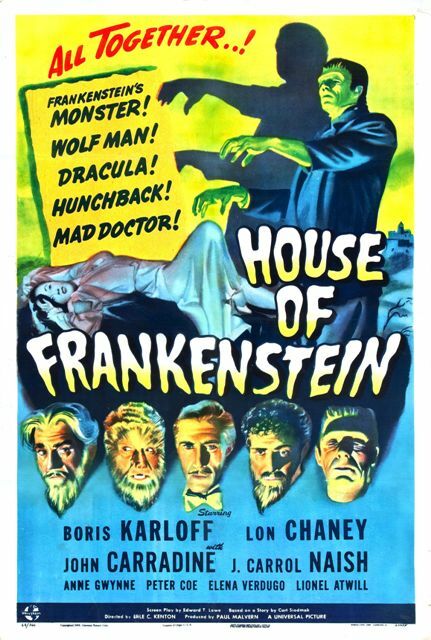 When Svengoolie shows a film from one of these past masters, it is a bona fide tribute to the same era of Hollywood that produced the chills of Frankenstein, Dracula and their supernatural brethren. As the Son of Svengoolie, Koz brilliantly bent chroma key technology to his playful will by appearing as Groucho, Chico and Harpo in one classic sketch. The man uses rim shots and rubber chickens to introduce monster movies, fer pete’s sake. He’s a natural to slide between werewolves and whoopee cushions. Rich Koz has a genuine passion for all of these older films, and it’s only fair he gets the opportunity to display his broader love of cinema’s golden age. Besides, I can think of no one better to sing the praises of the Marx Brothers than a guy whose worn a painted black moustache for at least as long as Groucho did. 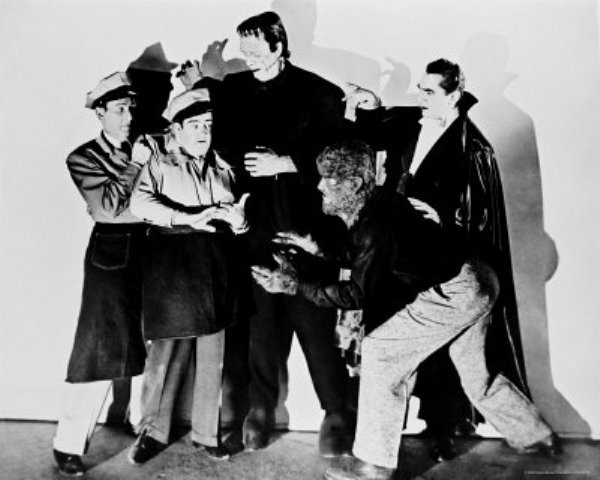 For anyone still unaccountably confounded by the whole hey-it’s-not-a-horror-movie issue, consider this: Horror comedies (like Abbott and Costello meet Frankenstein) are beloved by Monster Kids everywhere. From horror comedy, it’s just a short step to surrealism – and arbitrary anarchy of Duck Soup has more in common tonally with the surreal atmosphere The Cabinet of Dr. Caligari than it does with the hormone-saturated monkeyshines of Meatballs, which also – by the way – aired on Svengoolie’s show. And there you have it folks! If you,re still shaking your heads in disgust there is little else I can say other than, just don’t watch! After all, kids…IT’S ONLY A MOVIE!!!! This entry was posted in Horror Hosts, Stalking Svengoolie! and tagged Abbott & Costello, and LOOK WHO'S TALKING, and THE DEADLY MANTIS., CANNONBALL RUN, Duck Soup, Elvira: Mistress of the Dark, HOUSE OF FRANKENSTEIN, Phantom of the Opera, Svengoolie, THE LONG LONG TRAILER, The Matrix. Bookmark the permalink. ← Tribute to Horror Host Ghoulardi! I have a complaint, so I’ll air it here. Why oh why do you insist on having white text on a black background. While it does initially look nice, it is murder on the eyes! I love your blogs and I like to read them in depth, but it really does give me a tremendous headache. Please reconsider your design. Unfortunately that was the way the site was set up in 2010 and, to go and change it now, would require going back and re-doing over 250 posts. The other option would be to change the theme and then loose a lot of graphics and the overall appearance which we are happy with. We do appreciate your readership and are sure sorry to hear we’ve caused a few headaches. Maybe copy/paste the blog onto a Word document before reading? In the meantime we will continue to keep our eyes open for a new WordPress theme that will allow us to change the text color while keeping our links and banners intact. Well put Dave! I will admit I did skip a lot of shows the last year do to reruns but I would never have complained about them knowing that there is a new group of viewers out there. I’m looking forward to this months movies. Including Duck Soup why not! Sven always makes them fun no matter what and that’s what this show is all about. 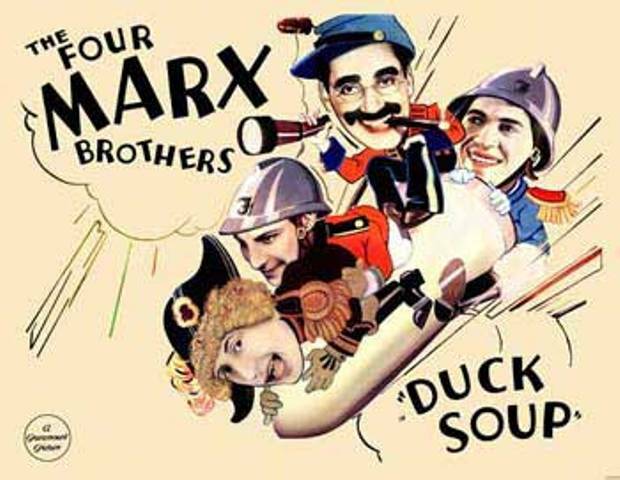 i like the marx brothers very much. it is 10:50p where i am and have been spending the last fifty minutes looking for the movie duck soup on svengoolie’s show on mytv. i am quite disappointed and i might add this isnt the first time that mytv has advertised a show only to find out it wasnt on. im not at all happy. Richard, that is indicative of your local MeTV affiliate changing the programming I would imagine. I know that there were some issues like this going on via the Boston affiliate. I would contact them directly and complain while encouraging your friends to do the same. In the mean time, if you contact us via our email (terrordaves@ymail.com) we can send you a copy of this show. I would hate for a Marx Brothers fan to miss out.